Our theme this week was selected by our hostess Louise Granlund and she has created this beautiful arch depicting her heritage. What comes to mind when you think of your heritage? Traditions from your homeland? Ancestors moving to far away lands? Hardships and survival? We would love to see your artistic creations for this weeks theme! Hi, my name is Louise and I live in the midwest part of the United States. I have been married 25 years and we have one son who is ready to graduate college this spring. About six years ago I started stamping and paper crafting. I was immediately drawn to collage and vintage art. I love incorporating reminders of days gone by in my artwork especially when it includes personal familial items/photos. That’s why I’ve chosen ‘heritage’ as my theme for this week’s challenge. My arch touches on my Ukrainian heritage. My father was born there, coming to the U.S. as a young man alone without any of his family. He told us how poor they were in the Ukraine, living in a mountainous region where they tried to farm land that was not good for growing much. Half his siblings died of starvation. With no family here, my father found relationships with his people through the church. That is how I learned what it was to be Ukrainian. I went there for Ukrainian language lessons, music lessons and Ukrainian dancing lessons. At Easter especially our lives revolved around the many religious and cultural traditions of the Ukrainian church. And, yes, we would make the beautiful Ukrainian Easter eggs! So my arch starts with the colors found in the Ukrainian flag, blue and yellow. The bottom reflects the farmland of the Ukraine, with the only picture I have of my father as a young man. 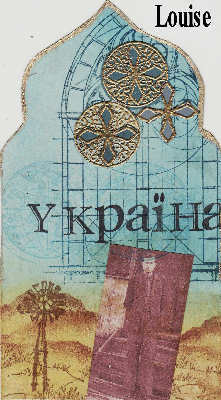 For the top of my arch I have tried to represent the church which was a vital part of my father’s life in his village in the Ukraine and in the United States. I look forward to seeing your arches reflecting your heritage and hope you will share a little of your story, too! Here is a little piece of my heritage. Here is my arch. Thanks for looking. Thanks Louise for sharing your intriging story! I don’t have a story this time but I did join in. When I think of a special person who was inportant for and in my past, I think of my Grandmother. She is a a big piece of my own Heritage. I learned a lot from her. A little “homage” to my parents. Bonjour, Here’s my participation ! Wow, there is a bunch, I didn’t know if anyone would have time today, I am so glad I have some to see. I didn’t know how to comment, sorry. I love it, your arch is beautiful. A loving tribute. Wonderful theme again this week. Here’s mine! Great theme!!! You can find my entry here. Here’s my Heritage arch-thank you! I too tried to leave a comment on your blogs to tel lyou how much I admired your arches, but could not do so. Thank you both for participating in this week’s challenge. Louise, thank you for choosing this wonderful theme! This is my first Gothic Arches entry – thanks for a fun challenge. Hope everyone had a great Easter!! Here is my acrh, I made it with pleasure. I’m having problems leaving feedback on lasize’s blog but I love the arch, specially the Dutch stamp which really reminded me so much of my Dutch opa who had a huge stamp collection! A great theme! Here is my arch. Please scroll down in the post to see the arch. Thanks for looking! Here is my arch for the challenge… thanks Louise!!! here is my entry with a new shape. it’s a bout my adoptive grand mothers,two sisters , and marvelous women. Great theme! I really enjoyed making this arch. Thank you for looking! Here is my version of Heritage – a lovely thought provoking theme. Here’s my entry for this theme!! !